Keep your Caravan Safe ! 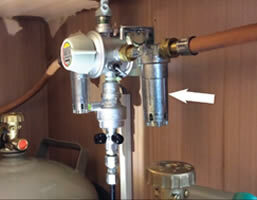 concern regarding its gas filter cups, affecting all items fitted since January 2012. And, if you’re wondering where a gas filter cap is, it’s sited between the regulator and the gas bottle – please see the image above. have been no reports of this happening. “As a premium manufacturer, Truma stands for absolute quality and reliable products, and the safety and well-being of our customers is our top priority,” says a company statement. The good news is that you can replace the gas filter cup quickly and easily yourself. First, close the gas supply, then unscrew the old filter cup and simply screw the new filter cup into place.